DVDs and Amazon Prime Streaming Now Available! A whiskey-fueled writing assignment takes one man on an epic motorcycle road trip through the bars and taverns across the American West. Riding a 1960 BMW R60/2 motorcycle with a sidecar, Sanders (Andrew Rizzo) is a down-on-his-luck writer on a mission to chronicle every watering hole along the way. With help of fellow traveler and dharma bum, Northway (David Ackroyd) and a variety of other colorful characters along the way, Sanders learns the way of the road and the zen of the bar. 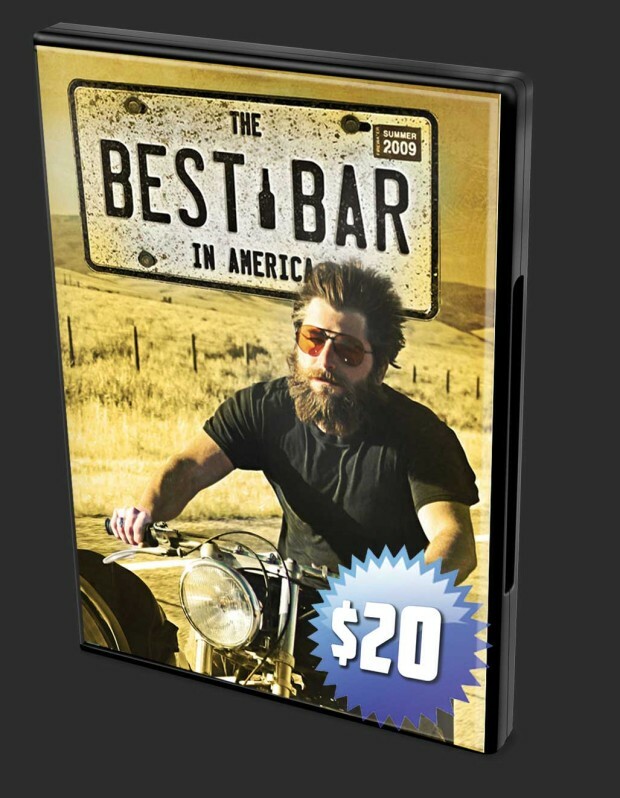 Motorcycling the West, sleeping on the ground, chasing mermaids, and drinking in America’s most legendary taverns, Sanders experiences firsthand the brotherhood of the bike and bar. Along the way, he gets advice from Ernest Hemingway and Jim Harrison on writing, drinking, and living life to the fullest. The Best Bar in America is a classic road movie for the modern age. Watch it for free on Amazon Prime! Click here! DVDs are in-stock and shipped the next business day via USPS First Class. Or, watch it right now! I hope you guys do more movies. Really enjoyed. We need more like it. Two thumbs up. Do you have a dvd available for sale? I would like to buy a DVD when it becomes available please. Interested in the DVD, what’s the cost? when can I by a DVD? Where can I get a copy of this film to view??? where or when can i buy a copy of this. Please let me know when the film is available for purchase on DVD. Please keep me posted on the release date and screenings. Thanks – looks like a great film. Can I buy a copy? Could you please tell me where I can buy a DVD of your movie please. It will be an International order, I’m in Australia. Thank You. when is the movie coming out on dvd? I am interested in purchasing the DVD. How do I but a copy of this movie? Where can I but this movie? Please can you let me know of DVD availability for the UK? How do I buy the DVD? Great looking flick. How do you get a copy? When will the movie DVD be available how much is it going to cost? How do I order a DVD? Can’t beat booze and motorcycles combination. Waiting to buy the DVD.